China's CNBM International Corporation has become the owner of almost 100% in PJSC Neptun Solar (this company owns a solar power station in Mykolaiv region), according to a company report in the information disclosure system of the National Commission on Securities and the Stock Market. At the same time, Austria's Activ Solar GmbH sold its shares in Neptun Solar. As reported, the Antimonopoly Committee of Ukraine allowed CNBM buy a number of solar power plants built by Activ Solar (the company is associated with fugitive ex-head of the National Security and Defense Council of Ukraine Andriy Kliuyev). 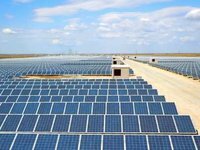 According to the State Agency on Energy Efficiency and Energy Saving of Ukraine, the Ukrainian feed-in tariff for solar power plants is one of the highest in the world.